I'm not sure I can think of another band who is as underrated as The Exelar. This record is so full of enthusiasm, catchy hooks, great musicianship and powerful symbolism. The production and mix translate a powerful a band playing music that is extremely unique. "Motherland vs Fatherland" blasts in with some great tone and striking melodic chords that translate some great power. The song launches into noisy chaos in seconds before dropping right back in to where started. 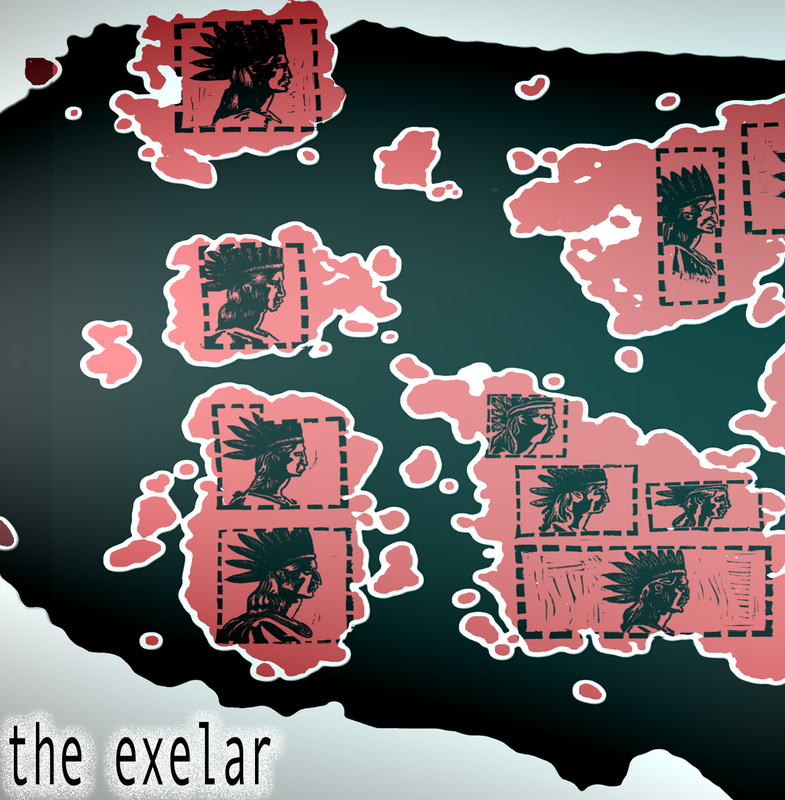 If you're meeting The Exelar for the first time, this is a great way to get acquainted. At 50 seconds, "Bait and Switch" takes you on a quick ride of calculated noise and power. "Firing Squad" takes that same dynamic even further with it's noise and catchy rhythm. At this point you come to love the dual vocal technique used by this band, one voice more horse and deep, the other an over the top scream. "What's Special About Me Is I Like Weather and Volcanoes" give us a rest from the onslaught as the 2 minute track's first minute is given to a sample speaking about the corruption of large nation states. The music blasts in with some intense power and the sample keeps reeling beneath. "Lines on Paper" seems to take Refused's "New Noise" riff and adapts it without palm muting, creating something totally different. The stop/start onslaught with vocals placed in between create some great aggression before dropping back into the high guitar riff, adding some extra instrumentation. "A British Smile" intros with the huge bass sound before bringing in the angry guitar and drum work. The song culminates with some great chaos that is catchy and powerful. "Non Fiction" shows the drummers ability to throw some great blast beats at you and, at 35 seconds long, it comes and goes faster than ever. "The Summer's Wort Horror Movie" had me thinking of some 90's obscure ebullition material. It's similar to "Lines on Paper", but carries a bit more flow and speed with it. The song breaks and allows for some beautiful clean guitar that gives us some time to reflect. There's no conclusion to this clean build up, the song just fires back in as hard as ever. With a barrage of drum rolls and desperately screamed vocals the song comes to a close with breakdown waltz. The title track seems to showcase the band's noisy side exclusively, not taking any breaks to allow some melody. "All the Mistakes Were Mine" closes the record out with a long guitar noise intro. The waltzy drum and bass drop in and seconds later a Malcom X quote fills the top layer in place of vocals. The song stays on the melodic end and does a great job of emphasizing the words spoken. So, if you want to hear one of the most underrated bands ever, check these guys out.